One March foggy night, 1921 the SS Governor, a 417 foot long passenger liner, steamed towards Seattle on a routine trip up the coast from San Francisco. 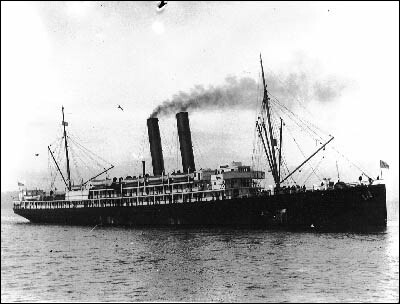 After dropping off passengers at Victoria, Canada, the Governor turned southeast towards Puget Sound. All was going smoothly until rounding the point towards Port Townsend, when out of the dense fog came the freighter West Hartland. 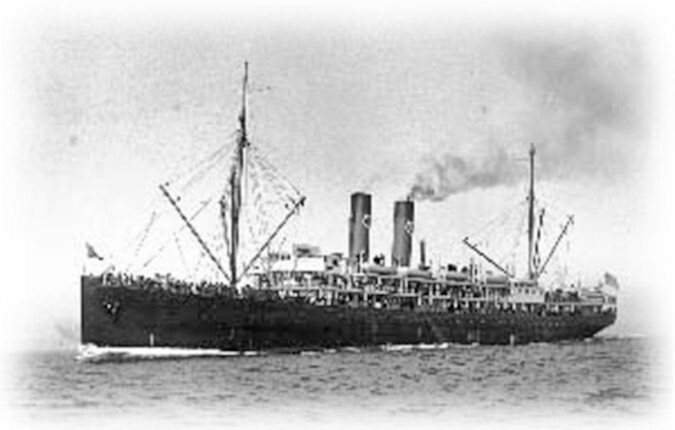 The West Hartland's knifelike bow penetrated the starboard side of the SS Governor essentially T-Boning her and cutting a huge hole in her side. 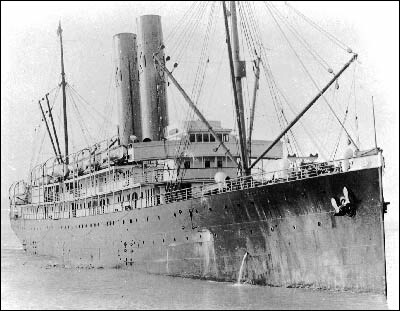 The SS Governor was not cut in half, but so deep a cut the Captain of the West Hartland Alwen, ordered the freighter "Full Steam Ahead" thus keeping the hole in the Governor plugged and the ship floating while the crew and passengers jumped over from the Governor over to the West Hartland. The electricity went out immediately and the ship was taking water fast. Luckily most were able to board the West Hartland. Within 20 minutes of the collision the Governor disappeared into the depths of Puget Sound with all treasures and contents aboard. 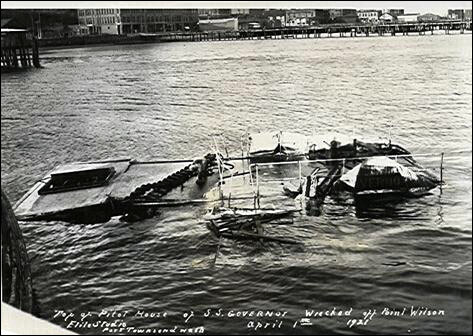 The deep swift waters off Port Townsend precluded any hope of salvaging her even though she lay upright in 240ft of water. The wheel house floated to shore the day after the accident. In 1976, Kelly Finn and Eric Morris became the first explorers to visit the ship in search of the mysterious safe which contained the San Francisco $20 gold pieces. In 1981 they returned with additional divers, Steve Ballard and Russ Barnes, and made a second attempt at the treasures which lay at the bottom of this emerald sea. Four years later the Argonaut society made a third attempt for the treasures. Kent Barnard, president of the society, did extensive research and valued the treasure to be worth about 1.5 million dollars worth. This created massive hype amongst the media and investors and at one time over 125 newspaper nationwide got. The salvage operation for the missing gold was to be conducted via a two-man submarine. The swirling 6 knot currents and unpredictable tides made this operation very risky and surface crew was extremely nervous the sub would entangle itself. After four unsuccessful attempts the operation was abandoned. The next group to try their hand was Northwest Salvage Ventures. After several mishaps, dive difficulties and problems, the expedition "Dive Operation Supervisor", Harry Truitt, called the salvage off. "It's like an underwater hurricane down there. We were going to lose somebody." In 1987, the next team of investors, Maritime Consultants (former Maritime Ventures), announced they had procured salvage rights and were going all out to raise the safe and other historical artifacts. They felt the combined value of the items might be worth 4 million dollars! The divers were able to recover some impressive artifacts for the Historical Preservation of the ship, but they too were unable to produce the gold. In August 1992, Maritime Consultants returned to make 4 Heliox dives from the surface. The divers methodically explored the decks producing portholes and other bronze artifacts and some quality china but despite their best efforts these dives still produced no gold or the elusive safe. Bob Mester, from Maritime Consultants, invited a small group of Fifth Dimension divers to make this 240ft dive using DIR and the GUE philosophies. This dive was conducted on October 17, 1999 and the objective of the dive was to survey, film and document the ship, taking video from the stern to the bow. Maritime Consultants joined the team on the day, as both a surface support vessel and to ensure the teams successfully found and hooked the wreck in these tricky water off Point Wilson. Mester discussed with the team the new theories of the missing safe and how it could be located in the debris field off of the stern. 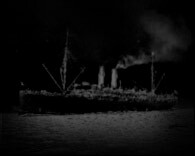 The nearly 400' long Governor sank stern first, her bow high out of the water, and struck the bottom with such force that the purser's safe was possibly torn free of its mounts and ejected off the back of the ship. Part of the team's objectives was to do a quick survey off the stern of the ship looking for signs of the safe.